You'll spot a Lego 'Brick Bucket' in the scene where 2 kids are playing Super Mario Bros 3 on the NES! Leela enters the Planet Express ship in a demolition derby for spaceships, and one of the competing ships is made out of Lego. Tom Hanks is in FAO Schwartz (Toy Store) having a gun battle with a kid and he’s creeping around a showcase, and in it very visibly are a few sets of Lego. Some LEGO bricks can be spotted in the toy box. There is a telephone made of LEGO. It's about an eight-year older who suddenly grows up, and his body looks like he's 40 (Renato Pozzetto). Still, he thinks like the child he is. After the old woman says "this money is not enough to buy this Lego", while crying he says "This morning I turned 8 and I can't have Lego..."
Will Ferrel the elf builds elaborate buildings of New York out of LEGO bricks. A Boy is seen playing with LEGO Bricks. In the great Robin Williams film, there are a few Lego sets (6175 Crystal Explorer Sub, and 6339 Shuttle Launch Pad) on the floor at one point. LEGO Display in a mall. They use a remote controlled Lego robot in a heist. If I remember correctly it was used to disable an alarm system or something like that, amongst other things it could climb a staircase. The main character is seen playing with Lego in a bar while the confused waitress watches him. A Two-Pack of stop motion Lego released on Video in 1998. The girl's son plays with Kopaka and a Bohrok--there's this extended 10 second period just him playing with it. There are Creator sets like the Dino, the Ferris wheel in the store. 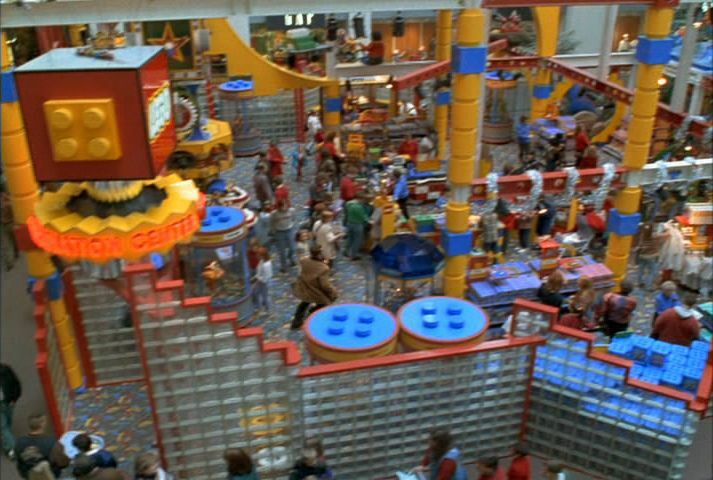 A Jackie Chan film, the climax fight scene takes place in a Lego store. Bionicle is visible in the background of some scenes. The teaser trailer features Lego bricks. About ten minutes into the movie Max is looking at his LEGO Minifigs. One’s an octan shirt with shades and a couple others including a yellow classic spaceman! The little boy Luke has a huge space monorail layout! When Gordon Brittas is hypnotised, he goes down to reception and find's receptionist Carole’s son Ben and a friend playing with a Duplo train on a small oval. Carole thinks she's in trouble for letting the kid's play with the trains outside. Brittas asks for various different thick rulebooks, but then makes a tunnel with three of the books over the track and a platform with the other. Brittas then asks for more tracks and later in the episode, he has made a large and elaborate Duplo train track layout with a few trains. One of the main characters used Lego Minifigs to symbolize protagonists in the various plots that went on in the show. 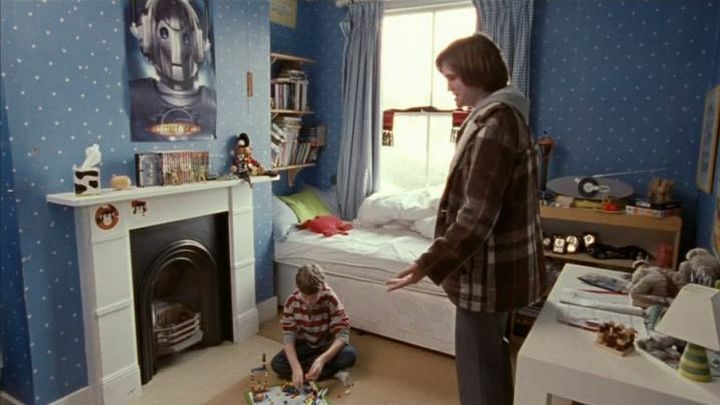 The appearance of some 2001 Bionicle sets Tahu and Gali in Louis' room. Peter: You got Legos? Aw, sweet! Lois only buys me Mega Bloks. Lois: They're the same thing, Peter. Peter: You know what, Lois? They are not the same thing. And the sooner you get that through your thick skull, the sooner we can get this marriage back on track. Han Gyul gives her a little toy Lego robot. Eun Chan is shown the back room, which houses Han Gyul’s collection of Legos (he used to work with them in the States); he marvels at concept of playing with toys: “Here, I can do anything I want” They play with the Lego (in a cute moment, Han Gyul “corrects” Eun Chan for bringing a bulldozer toy into the mix, because it doesn’t fit the time period of his horse-mounted knight-era setup). Tim built the first "Bait and Tackle Shop with a built in Women's Department" out of Lego. Joseph asked Bobby "Hey dude want to go melt some Lego?" Dewy and Hal build a private Utopia with Lego and Playmobil bricks, Lois crashes into it and destroys it. Dewey plays with Bionicle to make fun of his two older brothers. McGee uses a LEGO model of a warehouse to show how the bad guys could sneak out with the radar system without being caught on the cameras. Also Gibbs can be seen playing with the LEGO-forklift. The character "Cookie" has a BIONICLE Metruan arm piece on his glasses. 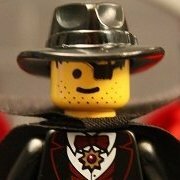 Max plays with LEGO in several different Episodes. There were two sketches done with (and about) Lego: In the episode "Slaughterhouse on the Prairie" there is a commercial for a new LEGO line called "LEGO Babel", and in the episode "Easter Basket" the pharaoh minifig makes his subjects build a pyramid for him out of Lego, but when they run out of bricks and start using different colors and parts from other themes, they decide to bury the pharaoh alive and keep the pimped out pyramid for themselves! The main character builds the Empire State building out of LEGO. That model then appears in the opening credits and a number of later episodes (both in the present and flashback). John and Riley wake up that same morning. She then gives him a Lego robot that she made for him out of the child's toys on the floor. He's briefly freaked by the representation of his future, but accepts it. A little girl can be seen playing with Lego twice, and in response, her mother creates a large tower MOC for her. The family goes to a mega-store called SHØP (a parody of IKEA) and all the food and forks are Lego. Homer makes an apple out of bacon bricks. The Simpson family visits Blockoland (a parody of Legoland), a theme park which is completely made of blocks. Lisa is ripped off when her Eiffel Tower kit has a missing Blocko piece. In response, Homer "sticks up for the little guy", and he gets Lisa the piece she needs. Couch Gag: The family room is built out of Lego. Using stop motion filming, the family is then assembled out of Lego, one by one. Homer's full head of hair is replaced by a Lego block which more justifies his baldness. Homer responds with, "D'oh!" There are some Lego sets scattered around Sooty, Sweep's and Soo's bedroom. Season 8 - Episode 5 "You got F'd in the A". Butters can be seen to be playing with Lego. Hyde: Told you to look where you were going. Jackie: Well what idiot leaves a Lego set right in front of the door? Eric: You knocked over my space command centre? I spent three hours building that. the dad tries to connect with his son (TRIES) and says "you still play with LEGO?" This subject came to be when a friend of mine (who knew that I collect/play with Lego) mentioned that she have watched this Korean TV Series wherein Legos were used as props. Out of curiosity, I decided to watch it and sure enough, several City Sets were used as display in one of the major character's condo. There was even a layout/diorama of a medieval battle in one of the rooms! Bionicles were also featured. So now, I'm wondering how many such movies or tv series are out there that you guys know about. To our South Korean brothers, if there are any in this forum... "nice job!" I'm not sure I follow the whole thing about the Korean show. It has subtitles: French, English, Chinese... You should try it sometime. 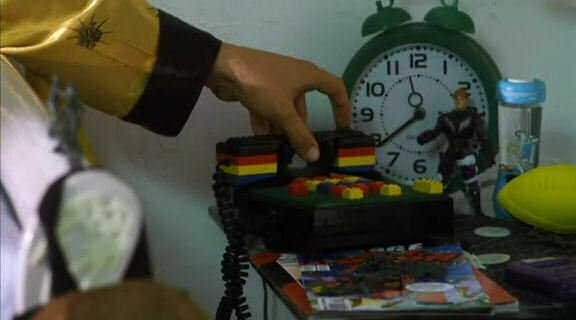 Malcom in the Middle had an episode with Lego too. Dewey build a huge Lego utopia (where they ate the stupid people), but the mother tripped and fell, knocking it all over. Of course they also mixed in playmobile. Didn't the kids take refuge in a Lego brick, in Honey I Shrunk the Kids? Plus there is the Simpson's Blocko-Land. Shortsightedness in my part. I apologize. The title is "First Shop of Coffee Prince" or plain "Coffee Prince." It's a 16-episode series and the Legos started appearing in either Episode 5 or 6. I don't have a link, sorry. Maybe YouTube has something. Like I said, it's very interesting as the director used Legos as some of the props, emplasizing one of the leading character's hobby is also collecting Legos. A friend told me that That 70s Show had a classic space 493 command centre in it and everyone picking on the guy for playing with lego because he was 17 or something. I also saw a 6206 Tie Interceptor on a shelf in a tv ad (unless I'm getting confused about where I saw it) her in Oz. In the pilot episode of "The Pretender", the main character builds the Empire State building out of LEGO. That model then appears in the opening credits and a number of later episodes (both in the present and flashback). It wasn't a particularly impressive model, aside from it's size. I think he was supposed to have been 6 when he built it, sort of a child prodigy plot. 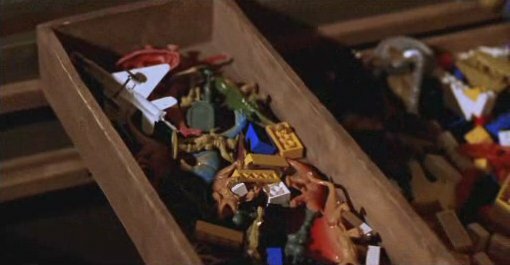 You can spot some 80s Lego sets in a toystore featured in 'Gremlins 2'. The stageplay of Priscilla in Oz a few years ago also featured a kid playing with Building Bonanza 4886. 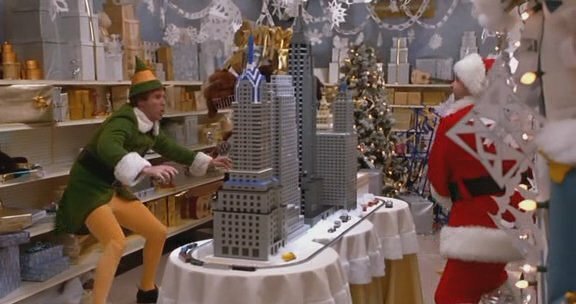 In Elf Will Ferrel the 'elf' builds elaborate buildings (supposedly of New York) out of supposedly LEGO bricks . In Death Note, one of last years's most popular Anime shows, one of the main characters used Lego minifigs to symbolize protagonists in the various plots that went on in the show. We discussed it before. It's a great show. Very different than most anime you have seen. At the beginning of the Fairly OddParents episode "Pipe Down", Timmy is trying to build a several feet tall version of the Eifel Tower with "Loco" bricks! There were two sketches done with (and about) Legos in the stop motion sketch show "Robot Chicken": In the episode "Slaughterhouse on the Prairie" there is a commercial for a new LEGO line called "LEGO Babel", and in the episode "Easter Basket" the pharaoh minifig makes his subjects build a pyramid for him out of Legos, but when they run out of bricks and start using different colors and parts from other themes, they decide to bury the pharaoh alive and keep the pimped out pyramid for themselves! Good stuff! I hope that helped and that you can catch those episodes! Also, talking about this kind of stuff makes me think of the "Lego Show", a German family entertainment & game show for charity that aired in October 2003 on the SAT 1 channel. The point of the show was it for a team to complete the task of building a bridge out of DUPLOs during the 2 hour show while some of Germany's finest comedians and the young ones in the audience competed in LEGO themed games - and if the bridge was ready to carry a car by the end of the show, the team would win and some preschools in need would recieve a literal truck load of bricks! It worked, so the show had a happy ending! Sigh... Good times, good times! Interesting. In Mr. Magorium's Wonder Emporium (on the sign anyway) there are creator sets like the dino, the Ferris wheel, etc. 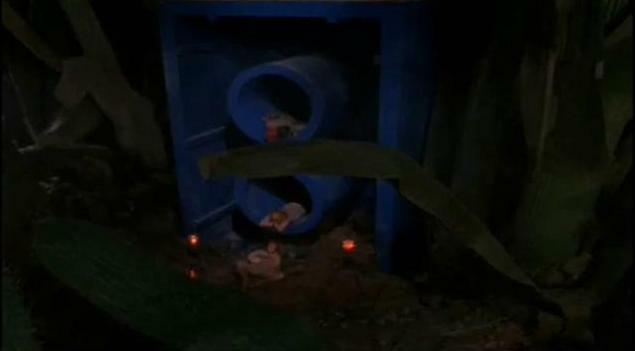 In one of the first episodes of Stargate SG-1, there is the 6339 Shuttle Launch Pad in O'Neill's son's room. YES!!! How could I forget that! That was one of the greatest moments in the history of family guy when Peter explains to Lois explicitly that LEGO is not the same thing as Megablocks! That episode was called "The tan aquatic with sam zimmer" or something like that. "They are NOT the same thing! and once you realize that, we can get this marriage back on track! In one of the movies in a swedish series of coupmovies called "Jönssonligan" they use a remote controlled Lego robot in a heist. If I remember correctly it was used to disable an alarmsystem or something like that. Amongst other things it could climb a staircase. In the great Robin Williams film, Jack, there are a few space Lego sets on the floor at one point. By seeing those sets I estimated the film to have been in 1996, and it was! Haha. and an episode of "war at home" , the dad tries to connect with his son (TRIES) and says "you still play with LEGO?" 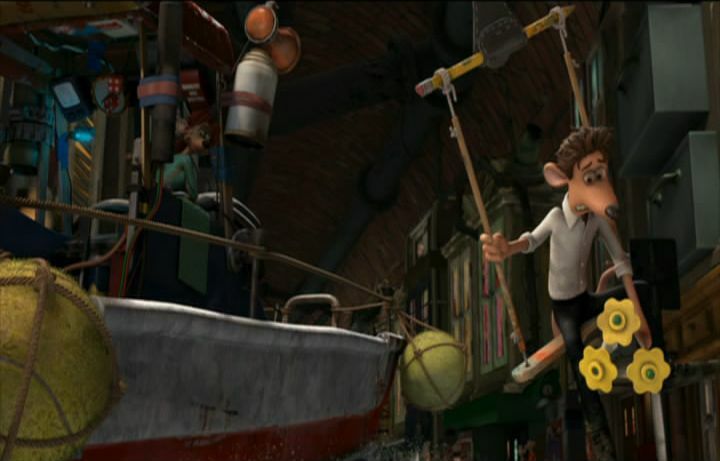 In flushed away this lady(rat) is getting married in the sewers and she has a lego flower.